Q: Your estimation of the tournament organization? Sergey Rublevsky: It is better and better with every Cup. The weather, to say the truth, left much to be desired. But it is not that important. It is a pity that I have to leave such a nice city so early. Anyway I am sure that the World Chess Olympiad 2010 in Khanty Mansiysk will be organized on a very high level. Q: Lately you don’t play much… What is the reason? Q: Did you decide to spend more time with your family? Sergey Rublevsky: No, I just don’t want to play trifling tournaments having 2700. In principle there are no tournaments for me. Opens are not considered by me. I think I should play rare but better. 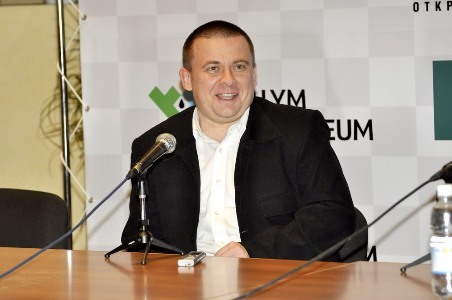 Q: What is your opinion on the FIDE Grand Prix tournaments? Q: Perhaps per rating average? Sergey Rublevsky: I don’t think so. I was the first in the reserve list. Two participants refused participation in the Grand Prix series, but other players were included: Rustam Kasimjanov (Uzbekistan), Pavel Eljanov (Ukraine), Evgeny Alexeev (Russia). Only one of them had a higher rating. In general, my opinion is that they should make a clear system for the Grand Prix in order to exclude situations like mine. 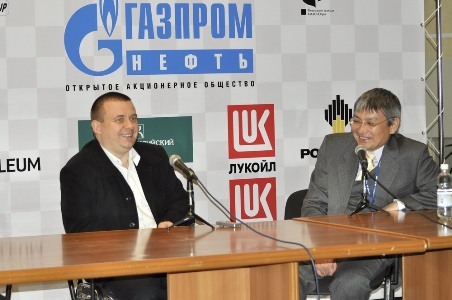 Q: Would you like to take part in the FIDE Grand Prix tournaments? Q: Are you planning to take part in the Super finals of the Russian Chess Championship? Sergey Rublevsky: I doubt it…. Q: Perhaps you’d better hire a professional manager who would take care of your business? Sergey Rublevsky: I don’t think it would help. The calendar has such strong super tournaments like Tal Memorial, for instance. Or “unremarkable” tournaments of which I don’t care. For the players like me, there is only one worthy tournament: in Poikovsky. I can consider “Aeroflot Open” as well . Actually this is all. Q: Do you work a lot on chess? Sergey Rublevsky: For the number of the tournaments I take part – it is enough. I try to be aware of all chess news. Q: You were in a team of Vladimir Kramnik when he played the World Chess Championship. Did it influence your career somehow? Sergey Rublevsky: I did not improve much, but anyway I did not regret to have had such an experience. It is a rare opportunity to work with great chess players like Vladimir Kramnik and Peter Leko. And I was even paid for getting such experience!